In a showdown of two very different semiconductor stocks, one chipmaker is a clear winner for long-term investors. Coming into the close, 2016 is shaping up to be another great year for chip stocks as a category. In fact, the major semiconductor index has more than tripled the market's year-to-date returns. 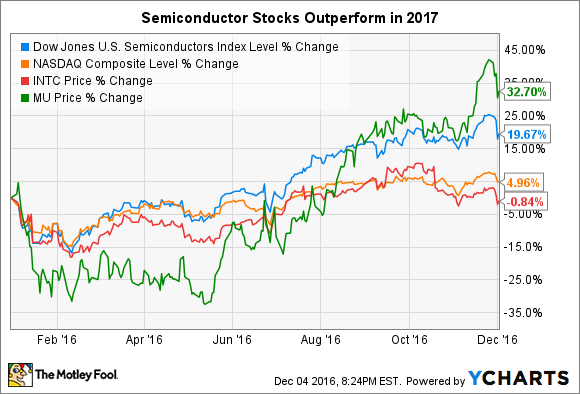 While the industry has had a good year, several specific semiconductor stocks have performed even better. Case in point, memory-chip maker Micron Technologies (NASDAQ:MU) has simply trounced more dominant industry players like Intel (NASDAQ:INTC). But which is the better buy today? To determine whether investors should snap up Intel or Micron Technology, let's run each of these semiconductor companies through a three-part analysis. As a starting point, it bears noting that Intel and Micron differ tremendously. As just one example, Intel's $163 billion market capitalization stands over eight times greater than Micron's $19 billion valuation. In light of this, it comes as no surprise that Intel operates on an entirely different scale than Micron, as you can see from their respective balance sheet metrics below. Data sources: Intel investor relations, Micron investor relations, Yahoo! Finance. Interestingly, Intel and Micron actually appear more similar than different in terms of their financial integrity. Both companies hold cash and investments that amount to roughly half of their respective total debt. In balance, neither company appears to be patently overleveraged, especially in the context of the capital-intensive semiconductor market. Thanks to its massive economies of scale and its higher-margin chip businesses, Intel boasts far larger cash flow from operations, which tips the scale in its favor in this category. The current ratio measures short-term liquidity. At a value of one, a company's current assets (cash, marketable securities, recievables) are as large as its current liabilities (short-term debt). As we see in the chart though, both Intel and Micron have plenty of liquid assets on hand to likely cover any near-term needs, so no sweat there for either company. Though some see faint cracks beginning to appear in Intel's PC- and server-chip monolith, there can be little question that Intel easily beats Micron in the area of competitive advantages for a few reasons. Intel dominates in its two core markets -- the PC and server microprocessor industries. According to one measurement, Intel controls roughly 80% of the PC semiconductor market and 99% of the server-chip space. This gives Intel ample leverage with server and PC manufacturers, and its pricing power is reflected in its cushy 60% gross margin and 20% profit margin. More importantly, Intel's leading design and manufacturing capabilities help keep the company' products better than, or at least as good as, the competition. True, chip rival Advanced Micro Devices has a plausible strategy to challenge Intel in servers and some more-niche areas of the computing market. However that attack is in its infancy and AMD has a notable history of failed execution, so it's fairly safe to assume Intel's competitive advantages will remain durable into the medium term at least. Unlike Intel, Micron enjoys few if any competitive advantages. Along with Intel and Samsung, Micron manufactures memory chips, primarily DRAM for PCs and NAND flash for mobile devices. Importantly, though, a mere 2% of Intel's sales come from memory chips, whereas Micron's entire business revolves around memory-chip sales. Unlike CPUs (microprocessors) or GPUs (graphics processors), storage chips are a commodity, giving the companies that make them little in the way of pricing power. Micron's 20% gross margin is a nice example of this dynamic. In moments when demand exceeds supply, Micron could enjoy massive near-term profit growth, which many expect for the company in the near term. However, industry oversupply can lead to abrupt losses, making the memory-chip market overall a boom-and-bust space. When it comes to durable competitive advantages, Intel easily takes the cake. The valuation department is perhaps the tightest race between the two names. Here's how the two semiconductor companies compare on a few of the most commonly used valuation metrics. As you can see from the differences in their current and forward earnings multiples, Intel's general financial stability stands in stark contrast to Micron's yo-yo profitability. Micron's relatively constrained single-digit forward P/E ratio again hints at the level of risk investors see in the company's stock. Even as most analysts expect the underlying pricing fundamentals in the memory-chip market to stabilize -- propelling Micron back to profitability in the process -- the company's shares will still trade at more than a 50% discount to the broader market. With 27 sell-side analysts covering the stock, Micron's forward valuation isn't a signal its shares are patently undervalued. Rather, the discount reflects the inherent risks in the commodity-like pricing structure of its market. Intel certainly faces a few key concerns with its business outlook. The company missed the mobile market, faces a shrinking PC market, and will see mounting competition in data center chips. However, it has also moved aggressively to compete for market share in segments like the Internet of Things. Furthermore, Intel's massive research and development budget, which alone equals Micron's entire annual sales, enables the processor giant to keep its chip lineup at the forefront of its core market. In terms of which is the better stock to buy for long-term investors today, Intel stands as the overwhelming winner in my eyes.